In recent weeks US policy toward Cuba has become more aggressive and there are serious indications that the Bush regime's war efforts against Iraq will be redirected to our tiny struggling neighbor, Cuba. Currently there is a flurry of misinformation, half-truths, and out-right lies being used to justify more aggressive measures against Cuba. Recent measures to tighten travel restrictions are not only an unjust indictment of the Cuban people but also an infringement on our civil and human rights. 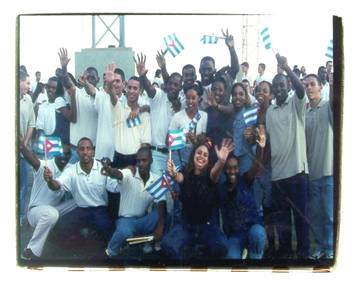 § Stop all forms of economic, military, and political intervention in Cuba! § Repeal the Helms-Burton Act and normalize relations! § Lift all travel restrictions! § Free the five anti-terrorists in U.S. prisons! § Take Cuba off the terrorist list!